Montreal is known as a food city. New restaurants are opening all the time and somehow there is always room for more. Granted, many of these restaurants struggle to make it, while the rest seem to become overnight hot spots. One such Chef who has seen success with both his restaurants, he did sell one of them though, is Chef Nick Hodge of the former Kitchenette and his trendy casual hot spot, Icehouse. 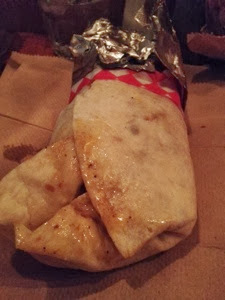 Burritos, tacos, nachos really anything TexMex or Mexican is a must eat in my book. When you add seafood and Chef Nick’s skills to the mix, a new level of flavour is created. 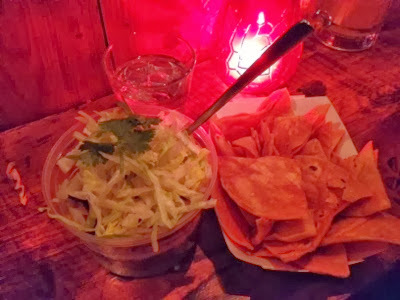 Icehouse is a small casual almost “Casse-Croute” style restaurant in the heart of the Plateau that serves up some of the best TexMex dishes in the city. I have to admit that I am in love with this place. The restaurant was crowded when we arrived, as always, but we managed to grab two seats at the bar. The blackboard menu can be slightly overwhelming, but after a few minutes our waitress came by to help us out. 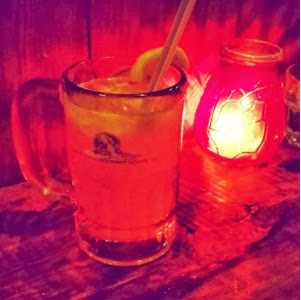 Before contemplating what we wanted to eat, we ordered up some deliciously refreshing bourbon lemonades. The strong bourbon taste blended with a sour and refreshing lemonade is the perfect way to start any meal. 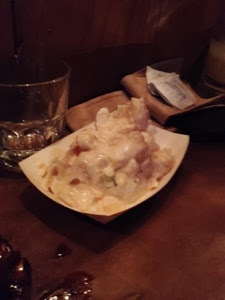 We started off our meal with a layered dip served with nachos. The dip was just what I expected, delicious. Nothing out of the ordinary though, just a really well made layered dip with fresh ingredients. 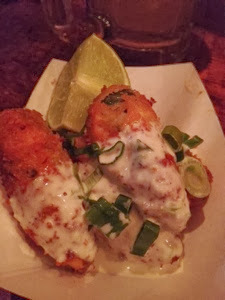 The jalapeno poppers were anything but ordinary. Nice large jalapenos stuffed with what I believe was a spiced cream cheese filling, breaded and deep fried, these spicy treats are a delicious way to start off your meal at Icehouse. Personally, I had so much trouble deciding what to have, but thankfully our waitress was there to help. Crab cakes, fried chicken, tacos, burritos, I really couldn't decide. Our amazing waitress, she really was awesome, suggested I try the lobster burrito. She swore it is unlike anything I have ever eaten and promised I would love it. I listened and order one as my main. The massive wrapped burrito that was placed in front of me was nothing I had ever expected. Grabbing the burrito in one hand and a napkin in the other, I took my first bite. I have to admit I was not immediately impressed, however as I dug in for the next bite, my mind was blown. 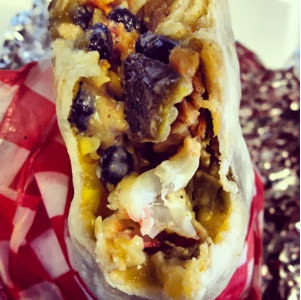 Large chunks of properly cooked lobster meat, corn, black beans and other ingredients combined together with a sauce unlike any I have ever tasted, made for the best burrito I have ever had. Honestly, I thought it to be a work of art. Each bite was more delicious than the last – fantastic. I was not able to finish the large burrito, it is really huge, so my waitress suggested I take it to go. I was hesitant at first as I thought it would be too soggy to eat the next day, but I agreed and took it anyways. It actually was just as good the next day for lunch; boy was I glad I listened. My friend ordered the ribs. As I mentioned before, Icehouse is a very casual dining spot. So casual in fact, that as you sit down to eat, a waitress comes by with a clean slab of brown paper that acts as your plate. When the ribs arrived, the waitress dumped the bucket on the brown paper in front of us and we dug right in. The ribs were so tender that the meat just melted right off them. 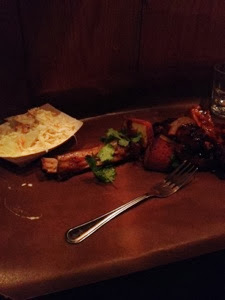 I really enjoyed the flavour of Icehouse’s ribs, and loved the touch of cilantro. 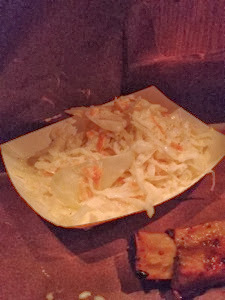 Coleslaw and potato salad was served alongside the ribs and to my surprise, I did not like either. I don’t know if it was the mixture of all the flavours I had already eaten, but I took one bite of each and they really were not for me. We finished up eating and paid our bill. As we were walking out, I noticed our waitress grabbed a seat at the bar and she was wolfing down some delicious looking taco. I had to interrupt her and ask what exactly she was eating. Had I not been so full, I would have sat back down and ordered one myself. She referred to the taco as Nick’s special taco and advised me that it has not yet made it to the menu. Fried chicken, lobster, crab and other delicious ingredients all mixed together and shoved into a taco – speechless! I left the restaurant satisfied and excited for leftovers and my next visit.